This trip is one of the deep anchors of our yearly rhythm. It is a gift. It is a gift passed down to us. A gift we are receiving. And a gift we pass down to ours. And we don’t know what the future holds. Will our beautiful little ones, who love this place so — who love it just as much as many of those in a long line before them have — will they have the joy of passing it down too? We can’t possibly know. And so, for this moment in time — for these moments of sheer bliss and crisp air and crystal clear lake water — for these moments of laughter springing and taste buds singing — for these moments of thrill and pride and gratefulness — for this moment in time we just soak it up. Because that is the very best we can do. That is how we can honor this gift that we have been given. We go each year, thinking it can’t possibly get any more fun than the year prior. And somehow, someway, it gets better and better. We say it every year, but this year it is really true: this time was the best ever. The drive is a killer (9-12 hours depending on all the complicating variables), but our bambinos are such good travelers that even that part is relatively painless. And then we arrive to the family cottage. And there it is, waiting for us, in all it’s little red clapboarded glory. My great-grandfather built it with his own two hands, and the five generations that have come up behind him have known it’s treasures. Growing up I thought it was a joy. But now — oh now! — the joy is multiplied three-fold. Because watching our three splash there with eyes wide with wonder… it makes the joy almost indescribably uncontainable. Everyone should be this lucky. The photos don’t do it justice. But it is the best we can do. So, here is the story, in photos, of the J-M’s 2010 NH Summer trip. 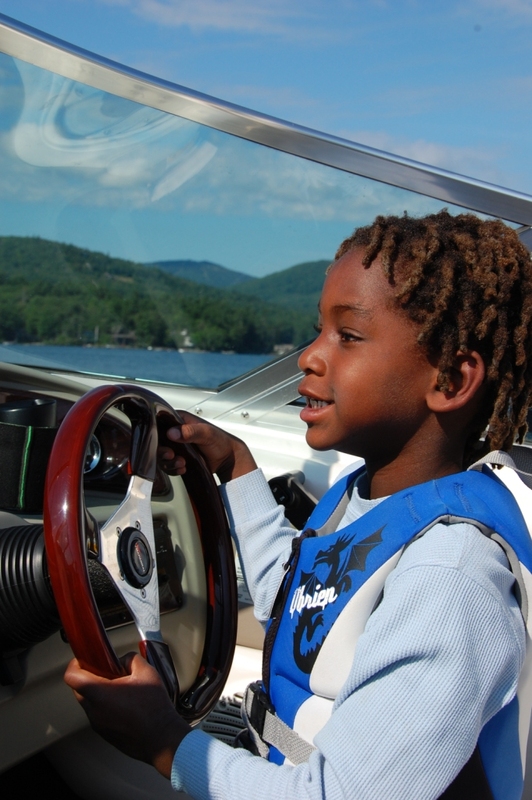 Kyle, The Six-Year-Old-Waterskiing-Wonder-of-Winnipesaukee. 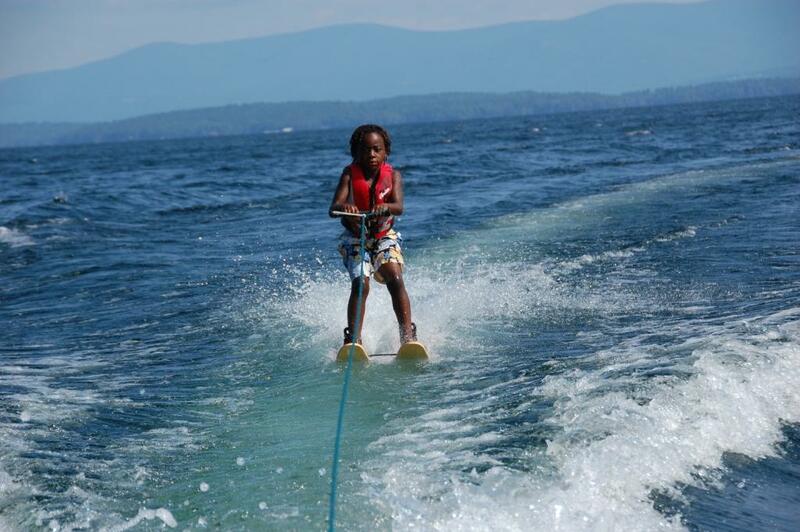 Seriously, when MorMor suggested that the boys try waterskiing I had all I could do to keep my mouth shut. I truly thought it was crazy– that they’d never be able to do it so young, and that it would just be a huge confidence-downer, and it would amount to nothing less than a huge pile of frustrated tears shed. Boy, oh boy, was I wrong. MorMor is always right. MorMor is always right. And don’t you forget it. By the second day trying, my boys had it mastered. Much to their mother’s shock, their grandmother’s delight, and everyone’s complete amazement. Yes, it is true: they are ridiculously-incredibly-wildly-athletically gifted. Their natural athleticism is a wonder to behold. But really—? !— waterskiing?! !–at age 6.2??? It was incredible to watch. And, from the back of MorFar’s boat, as the Official Spotter, I watched it. Over and over and over again. 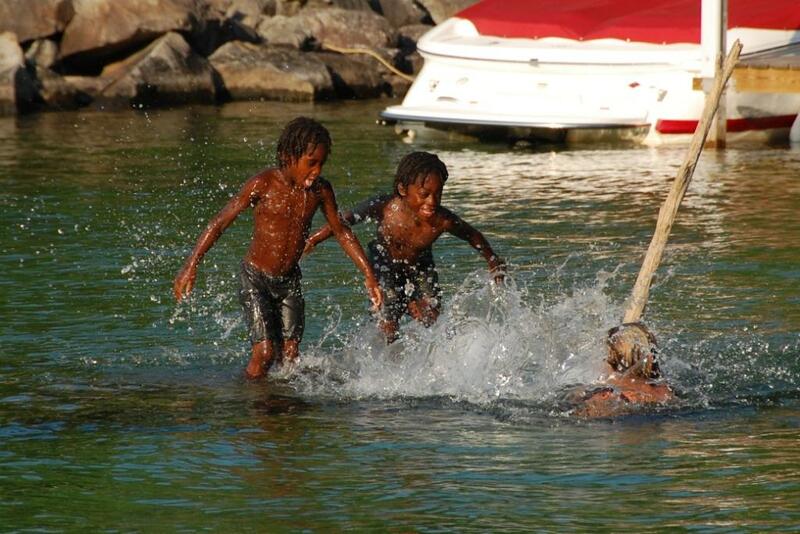 As my boys zipped around the cove, calm and strong, without falling, numerous times. And even the few times that they did fall, they just got right back up again. And I took about 2,000 photos of it all. Because even I could barely believe my own two eyes to see my own two boys doing this. 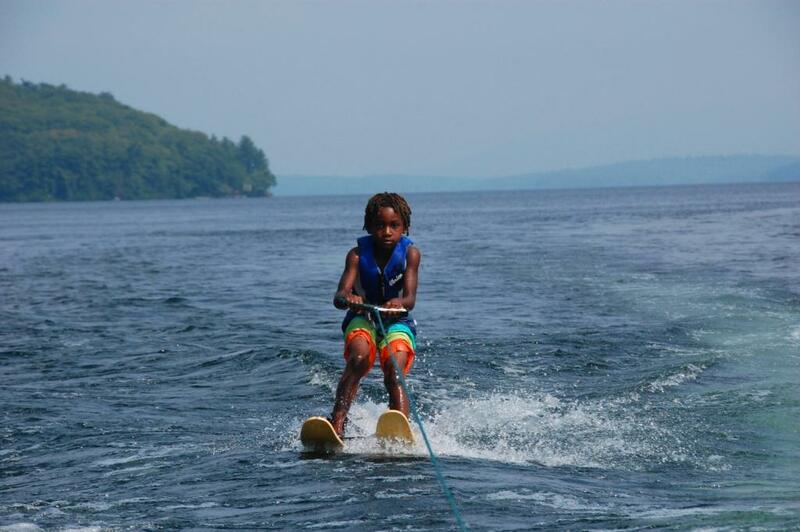 Here’s Owen, the other half of the Winnipesaukee-Waterskiing-Wonder-Twins. And then there was the fishing. Another first: 2010 = The Boys’ First Year Real Fishing. 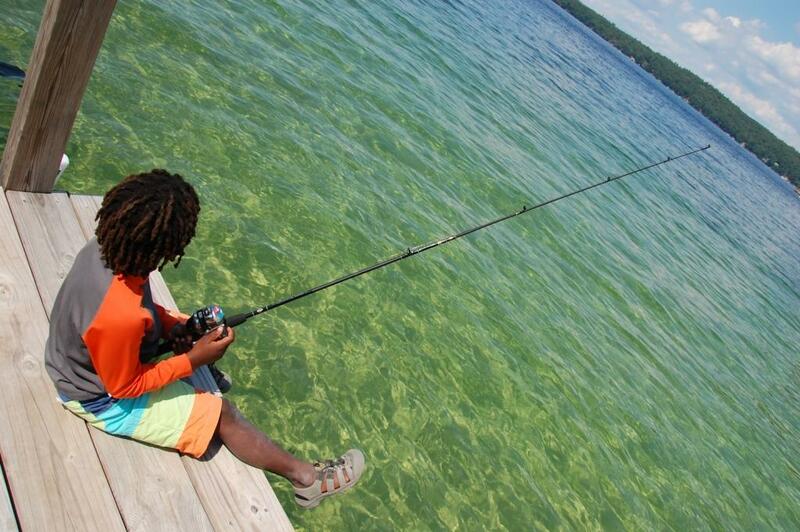 Kyle had been talking about fishing since last summer’s trip to the cottage. He had wanted a fishing pole for Christmas, and then for his birthday. Finally, as he had been promised, he got a fishing pole for our big trip. And that fishing pole did not disappoint. He spent hours with it. Hours fishing that ultimately paid off! 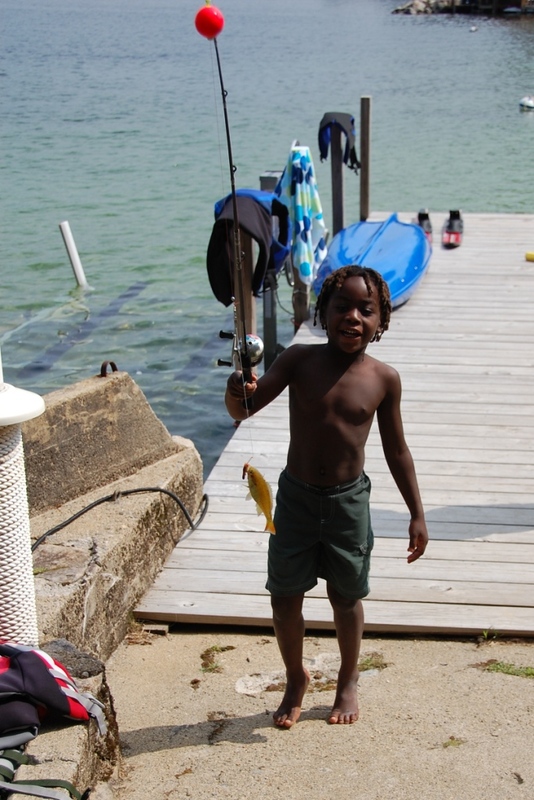 Kyle got what he had been waiting for: his first caught fish! A little few-inch sunfish. But a fish nonetheless. This is the look of pride. A special pride that comes with catching your first fish, with your beloved (and I do mean BELOVED) grandfather’s hands on your shoulders, with your family gathered around you cheering you on, and with your Mama snapping photos like a mad-woman! It is a good, good kind of pride. 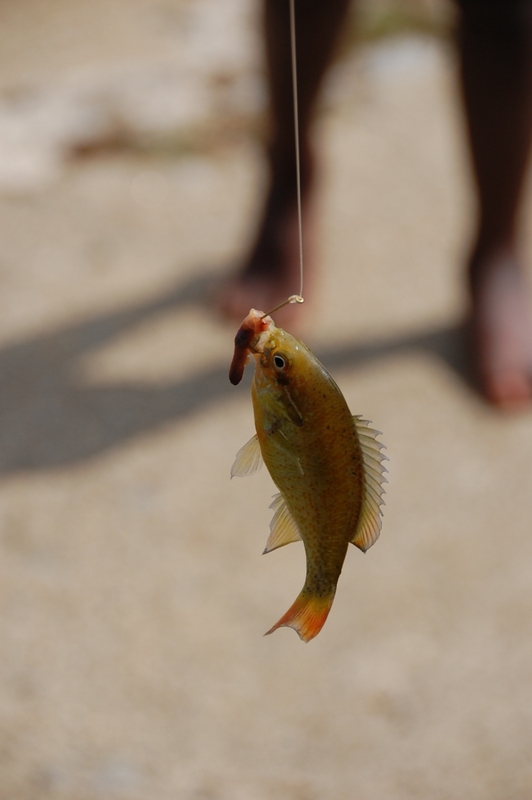 …there wasn’t a chance in heck that I was going to let him think that fish didn’t feed his family. And so… later that night… while Kyle watched Tinkerbelle with his cousin, brother, and sister, that little sunfish got to secretively swim away while I forced MorMor to chop a few small bits of haddock off a frozen pound-from-the-grocery-store that she had stored in the freezer. And pan-fried with lots of butter and a whole bunch of spices, that fish of Kyle’s (or so the kids all thought) was — according to Kyle — “the best fish he’d ever had!” And so it was. 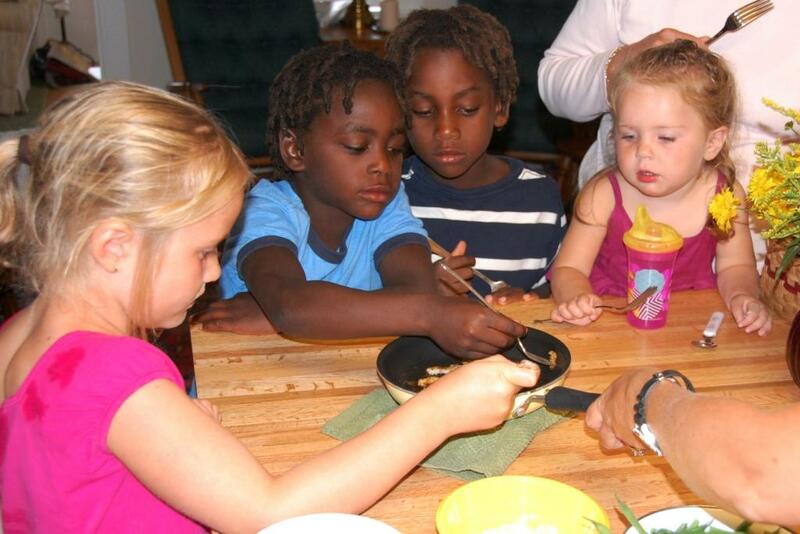 And then they rounded out their meal with heaping bowls full of good ‘ole macaroni and cheese. And life could not have been any richer. For Owen, the highlight was MorFar’s boat. And driving it is, especially for Owen, an especially high high. Owen’s other high: Kayaking. Our boys love it. Especially Owen. 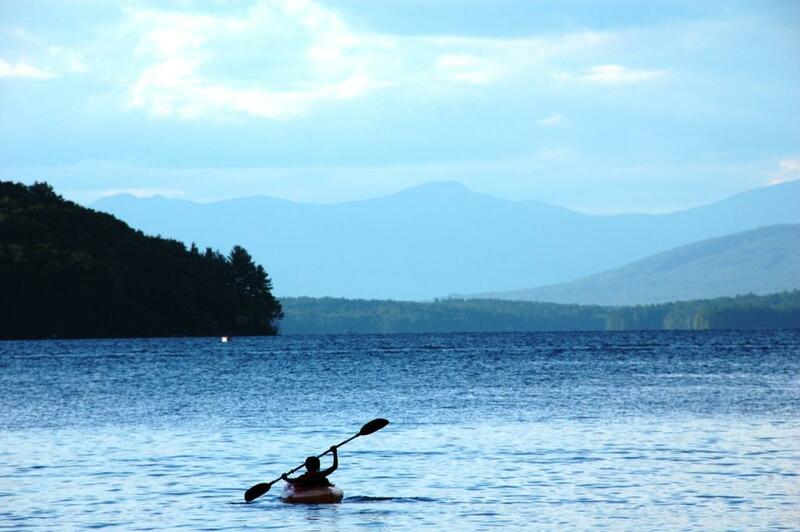 And to see our Owen, so strong and confident, independent and capable, solo kayaking on a still lake in early morning. Nothing much could be more soul-satisfying. 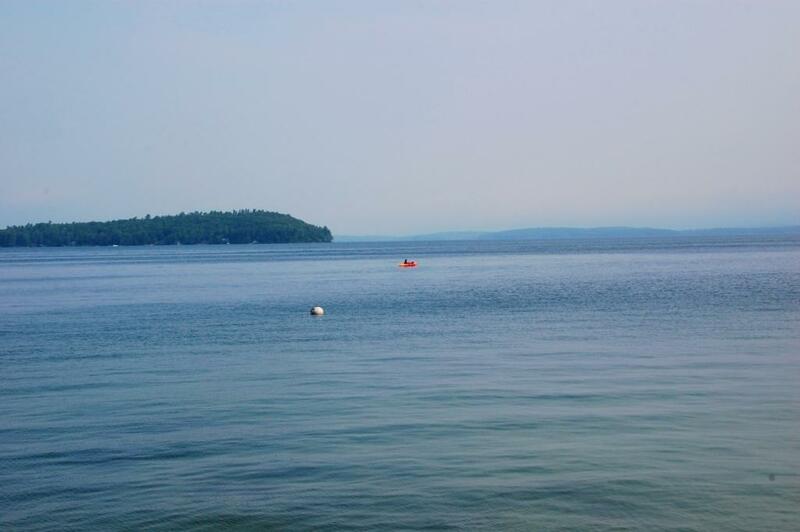 To see him — and to know his whole story — to see him so peaceful, so still, so fully living — out there in the middle of the lake — it makes you ponder the most profound parts of life. And it also makes you wonder what he’s thinking about out there so happily on his own. Those are moments to be remembered. 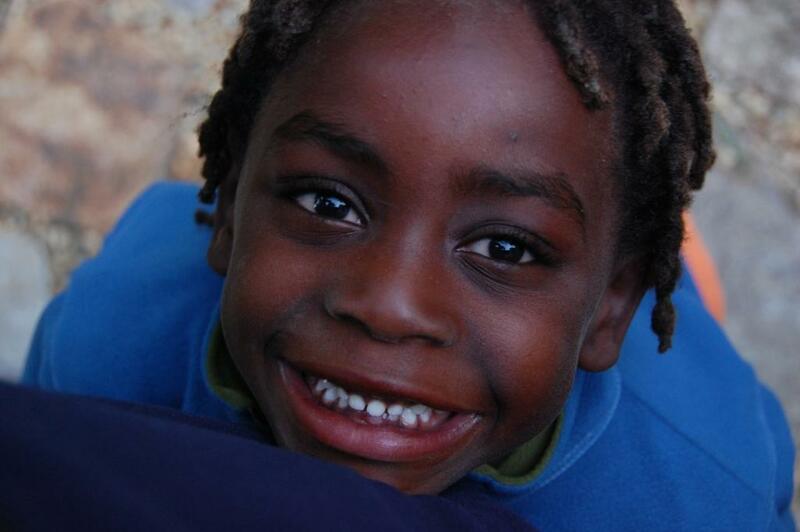 To watch your child do that, to see his confidence bursting through the seams, to know that he is happy — so happy — and, fortunate — so fortunate — those are things to cherish deeply. And cherish them deeply I do. And I know that he does too. As for Little Miss. She spent much of her time loving her life — as usual — and being the precious little thing that she is. Giving hugs and kisses to her people. Doddling and toddling around occupying herself with all sorts of things. Being busy as can be with her own type of chill-and-calm-and-centered-energy. She’s amazing. She found an old doll in the cottage closet, and it became her baby, and she fed it a bottle all week long. She had some mega-tantrums too, and continues to suffer from her travel-sleeping challenges… but… why focus on the yuck when there is so much yum? And as we are coming to learn about Meera Grace, she’s a true-blue thrill-seeker just like her brothers. 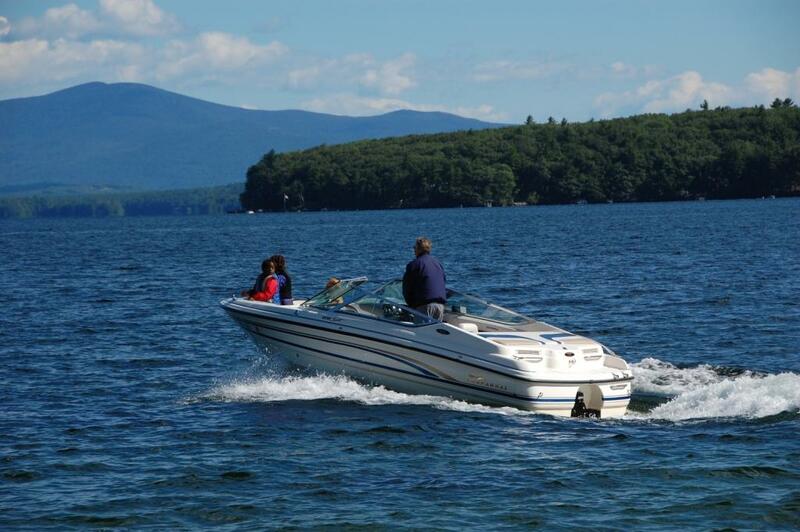 The faster the boat is moving, the wider the smile. And the bigger the boat bumps over the wilder the waves, the louder our girl’s laugh. 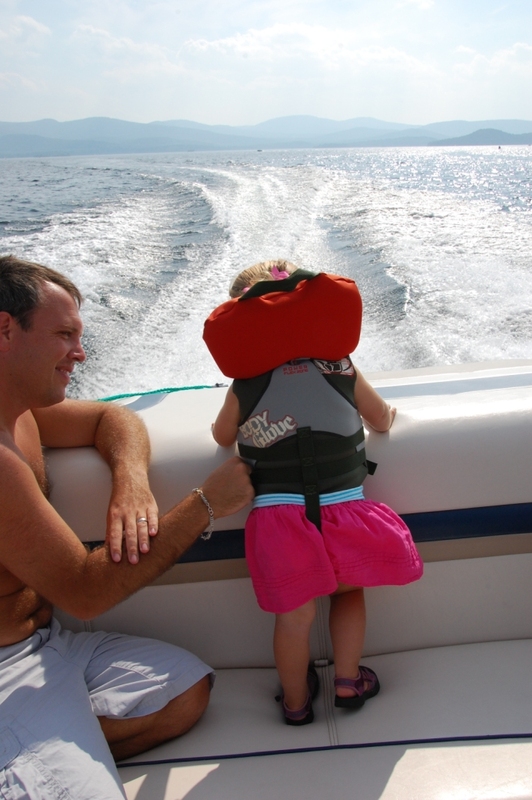 And her favorite spot on the baot is in the back, watching the wake… just exactly like her brothers have always done. Other favorite passtimes for Missy-Moo included bonding with her favorite peeps in the whole wide world. Her bro’s are definitely her favorite, but excluding them, #3 on her list is, for-sure, MorMor. #2 = Papi. 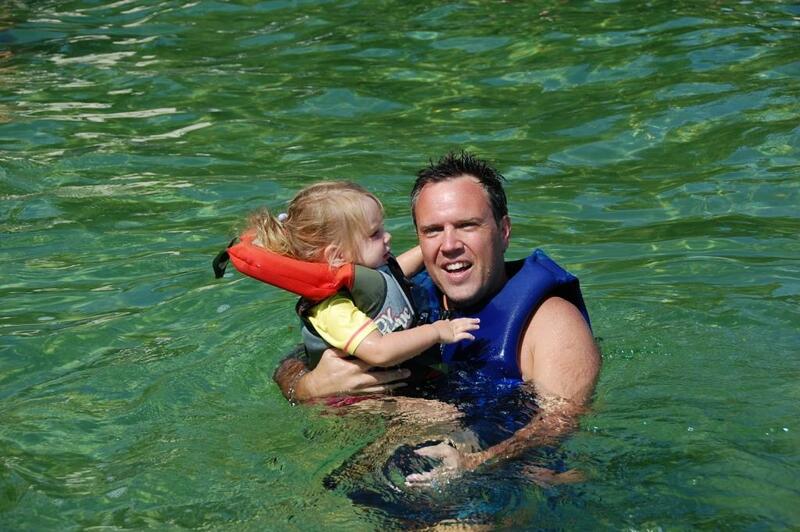 And nobody is more fun in the water than him. And numero uno: Mama. She’s my girl. No doubt about it. It is me who gets the best (oh the sweetness!!!) and the worst (oh the tantrums!!!) of her. And I take it all, every little bit of it, happily, thank you. It was an 8 day trip. 1 day of which was dedicated to our annual pilgrimage to StoryLand. 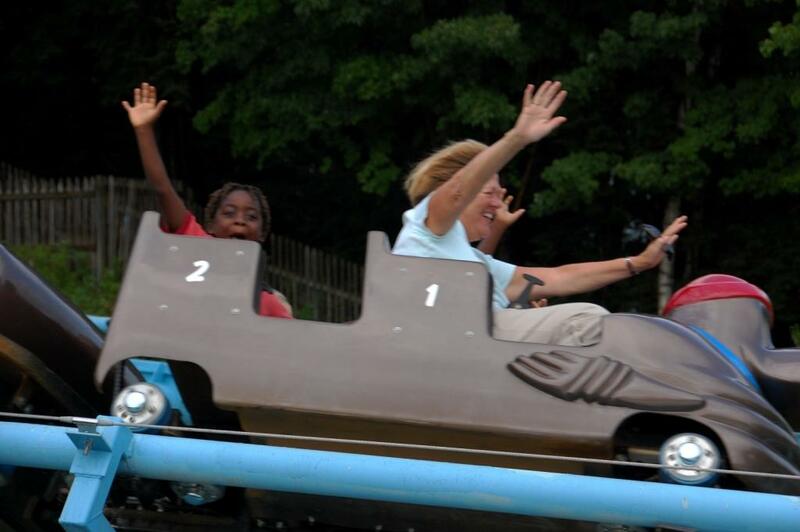 Can you imagine riding rollercoasters with your grandmother? I can’t. But it is pretty cool to see my kids do it. And they pretty much love every single solitary second of it too. 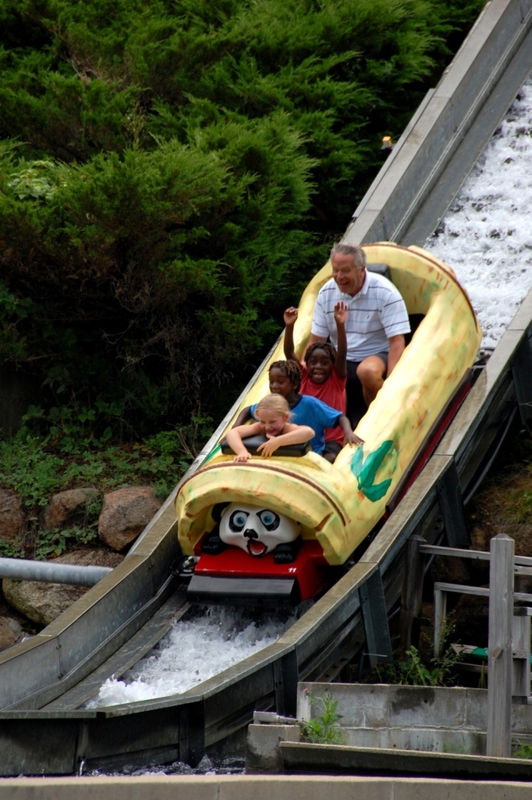 Can you imagine riding the “Bamboo Chutes” with your grandfather? I can’t. But it is pretty cool to see my kids do it. And they pretty much love every single solitary second of it too. Oh, and as the photos prove, MorMor and MorFar pretty much love it too! 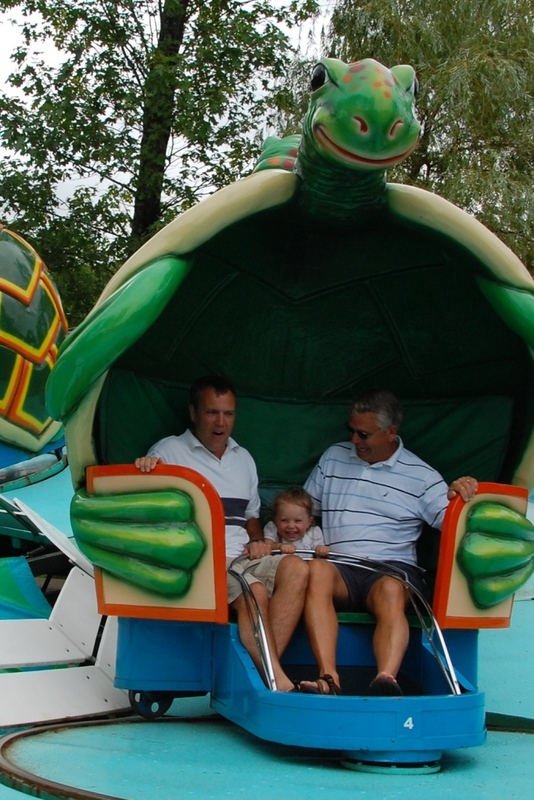 My mom and I haven’t laughed so hard in a long time as we did watching Braydon and my dad ride on the “Turtle Twirl” with Meera. Seriously hysterical. Meera was loving every minute of it. Braydon and MorFar had all they could do to not toss their cookies. I laughed so hard I thought my sides would split. I don’t want to forget those few minutes any time soon. My mom and I, in the middle of StoryLand, laughing our bedoojooles off at the sight of it. People must have thought we had lost it. Papi and MorFar did almost lose it (their lunch that is). 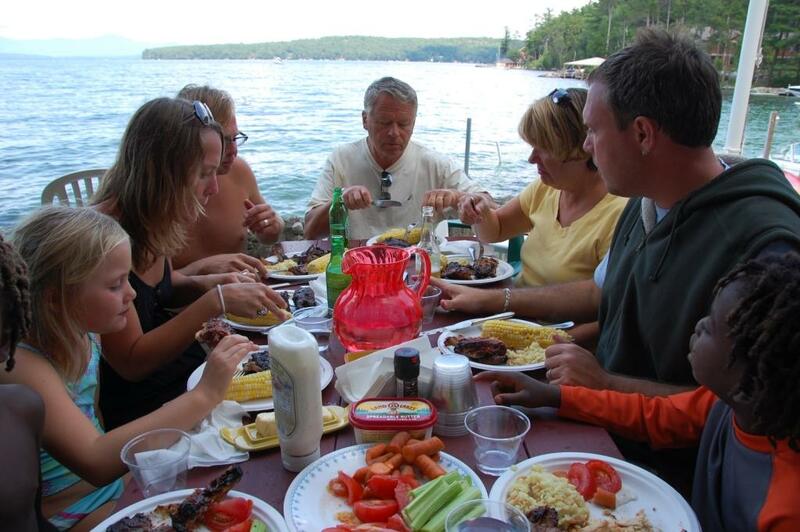 Speaking of lunch… the food… the food is always memorable when with the Johnsons, but especially when at the lake. Is it the food? Is it the view? It is the food and the view. And it is good. 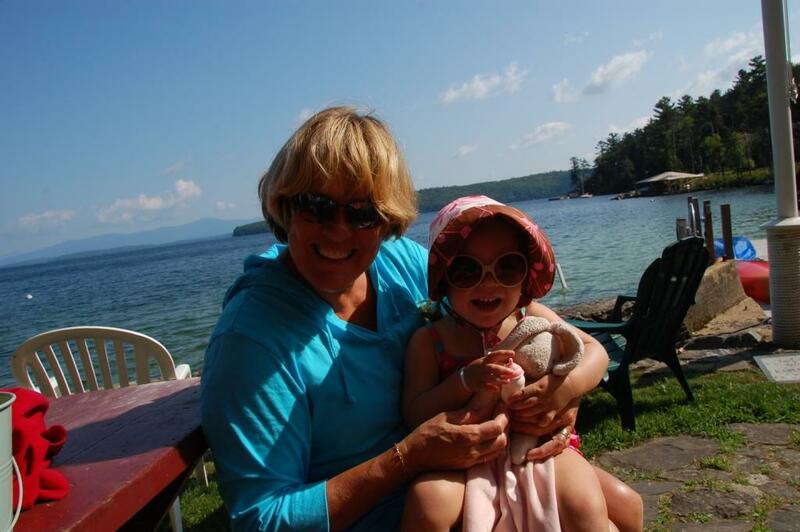 For our first full day at the cottage we were joined by Auntie Stina, Sadie, and the newly minted “Uncle” Mark. It involved ribs and chicken and corn-on-the-cob. 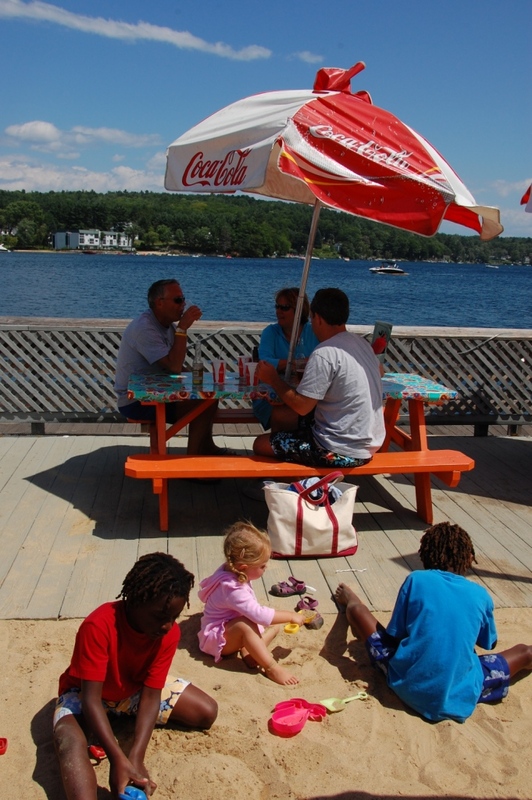 Something about the cottage grill makes everything thrown on it come out awesome — I swear. And something about Beans & Greens Farm Stand makes all the veggies taste better. As the week got rolling the food got rolling too. And there were several food outings. There was ice cream. At Sawyers, at Johnsons, at Bailey’s Bubble (that’s three days of homemade ice cream folks!). 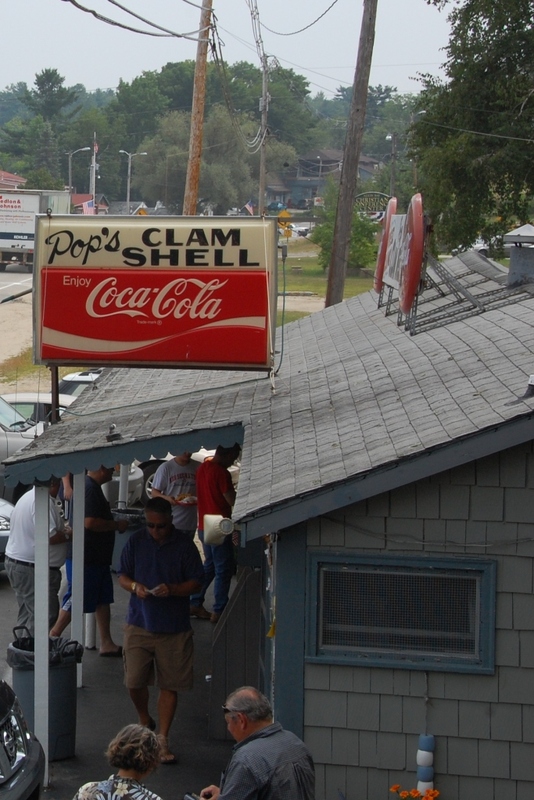 There were fried clams and onion rings on the roof at Pop’s Clam Shell. 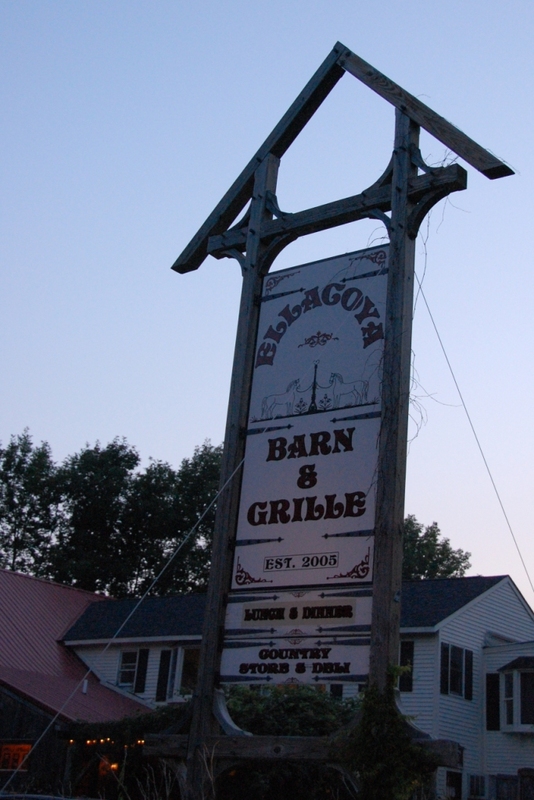 There was a date night for Mommy and Papi at our favorite cottage-date-night-place, Ellacoya. 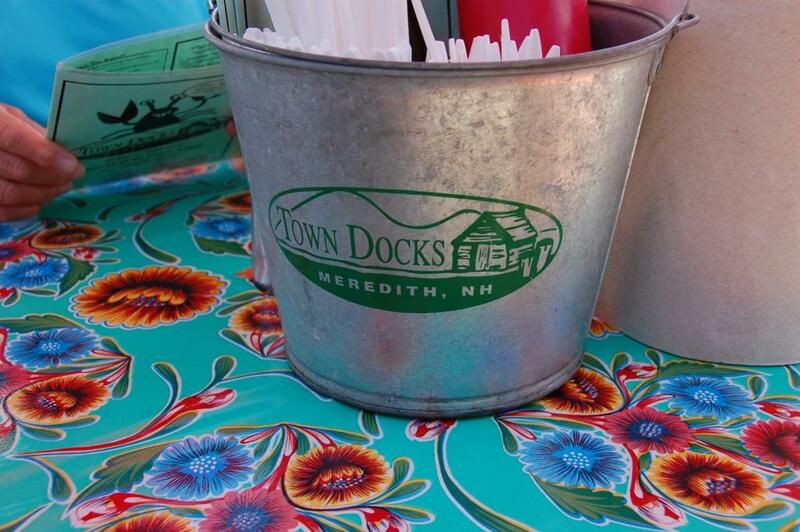 …without a doubt our favorite family lunch spot. 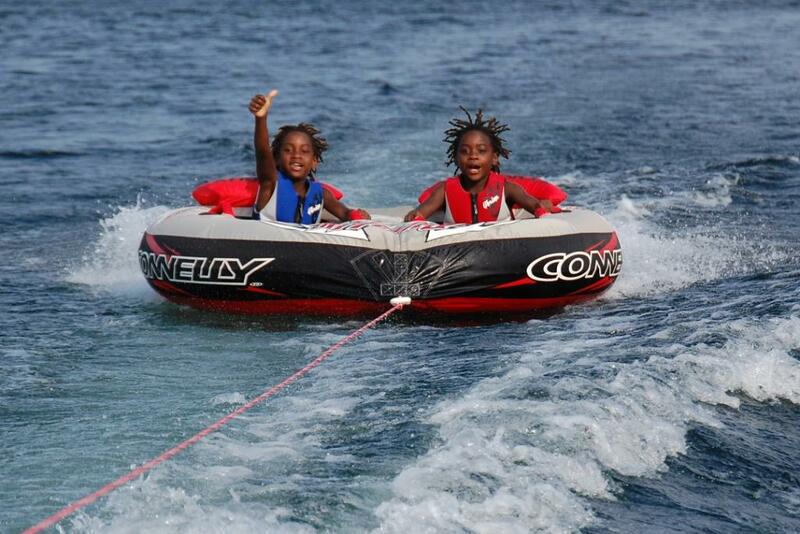 And there was lotsa lotsa tubing. The wild ones cannot get enough of it. 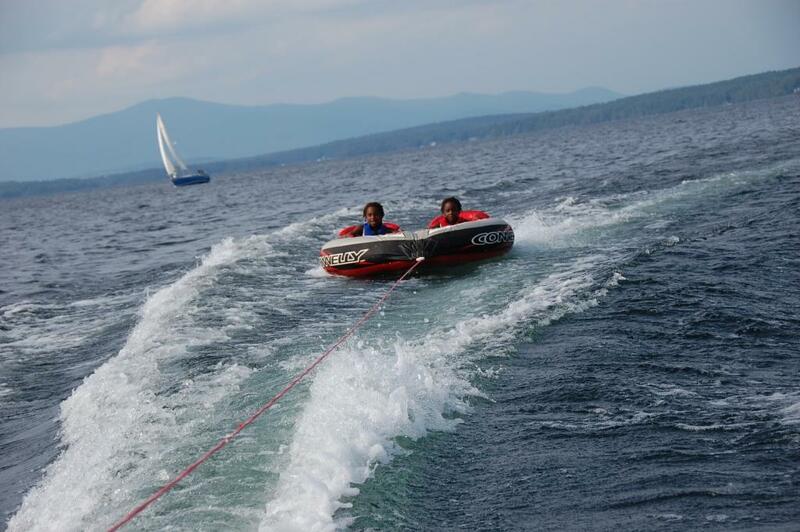 Meera’s First Tubing. 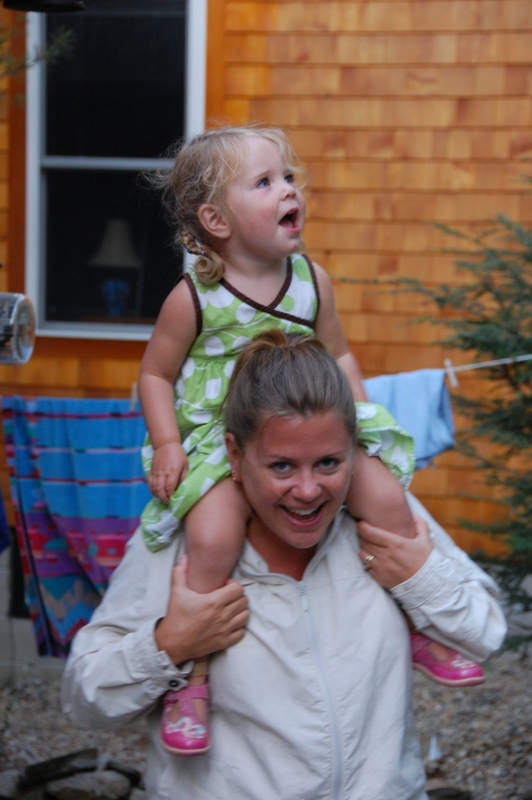 My mother thought I was crazy for putting my two-year-old on the tube (which is kind of funny since she’s the one who put the six year olds on waterskiis). And there were summer traditions. 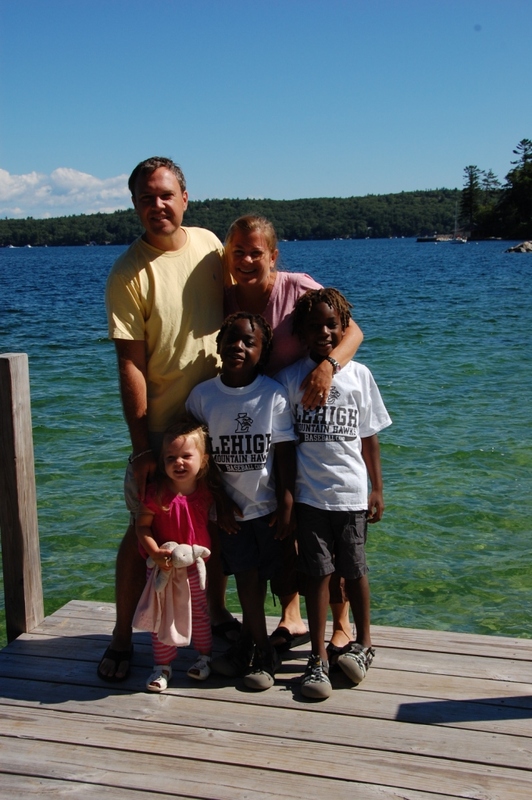 Traditions that have been passed down for generations at the cottage. 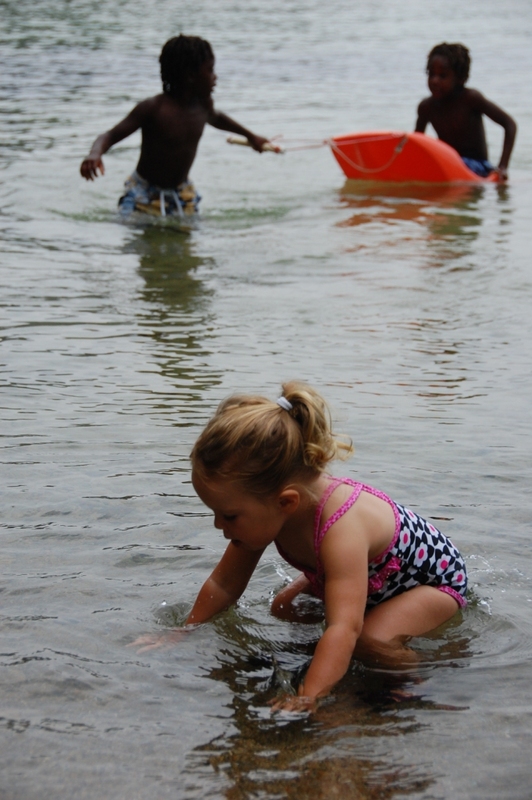 Traditions like swimming and playing at ‘First’-‘Second’-and-‘Third’ Rock. 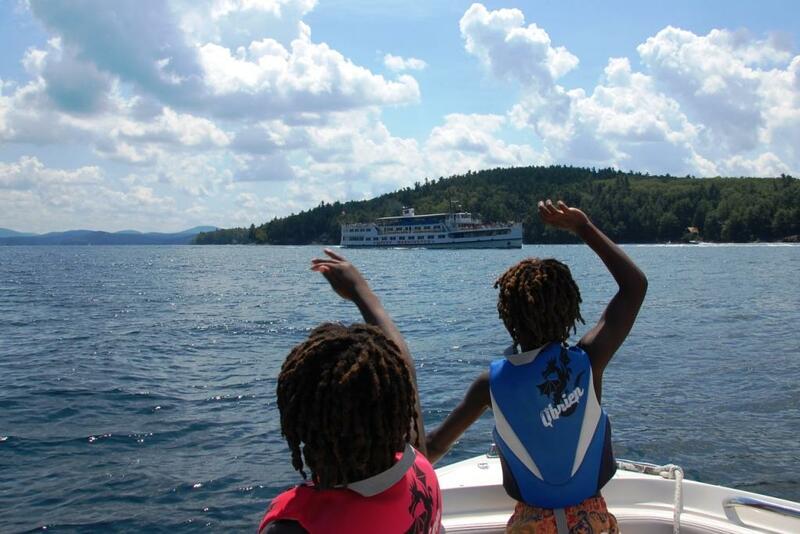 And traditions like riding out to wave to the Mount Washington boat (or, as K & O call it, “The Mount Washington D.C.”!). 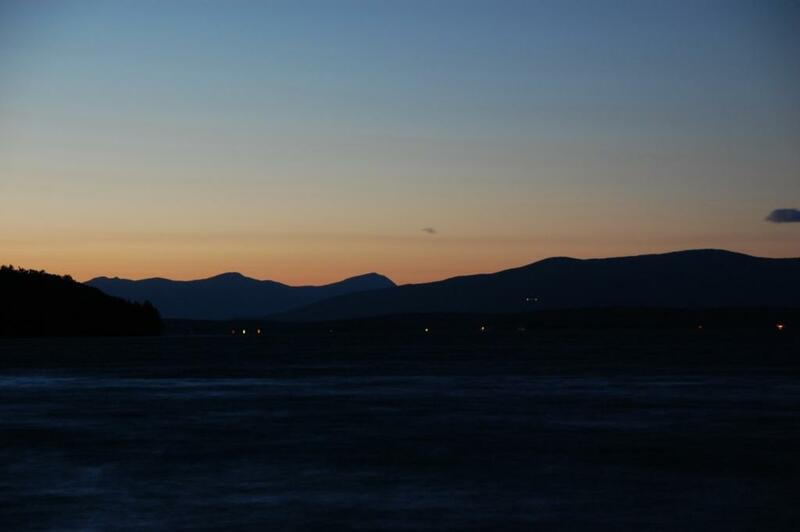 And blinking the cottage deck lights at the Mount in the dark of night, and getting the blinking light back from the Mount in return. These are things that I did when I was six, and my mom did when she was six. These are the traditions that make this trip such a deep, deep anchor in the otherwise sometimes slightly overwhelming life that we live. And there are quiet moments, when nobody is talking, but the world is listening. And it seems like the universe is telling us that everything is going to be o.k. 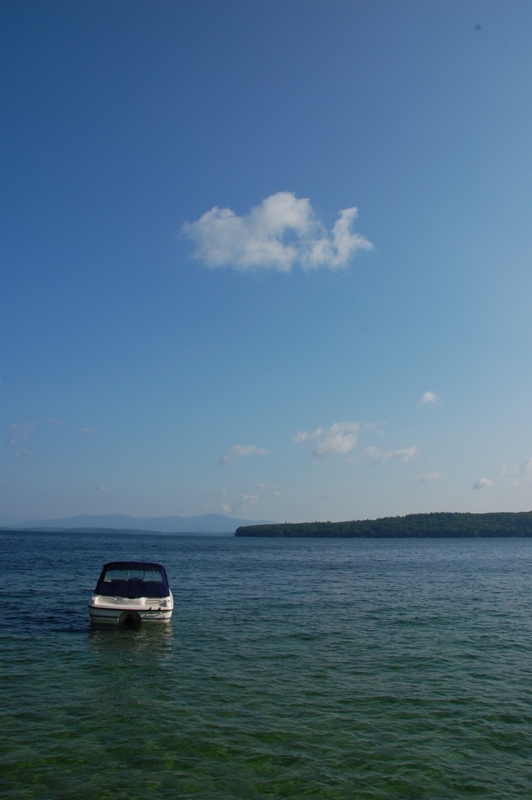 There can be quiet on a motorboat when it is MorFar’s boat and the wind is in your hair. 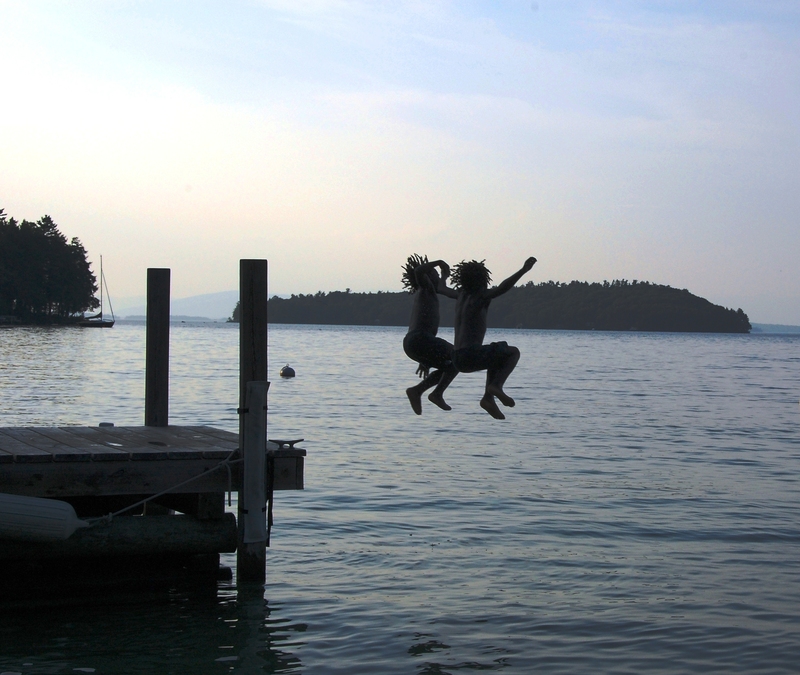 And there is a quieting — the good kind of quieting — of the spirit when you’re playing heartily with your siblings in the shallows of the lake. Discovering water and sand and all that is good. So, life is not perfect. But when moments come along that are as close-to-perfect-as-can-be, then right then and there we need to throw open our hearts with gratefulness for all that we have been given. For mornings with the whole day ahead of you. For evenings at the end of wonder-filled days. And for everything that is good and right in the world. We give thanks. Looks amazing! Glad you had a wonderful getaway!! Your writing always amazes me, very beautiful. Great pictures as well. I'm happy that your family had a great time! Thank you for sharing those memories. 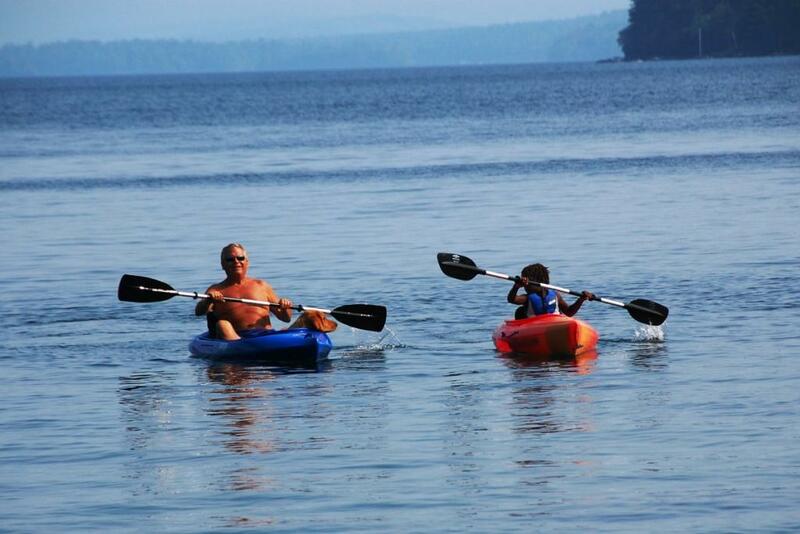 I had a very similar summer experience and was able to take my two boys to the Lake which is remarkably much like your lake, cabin, and experience. Sadly MorFar (we called him Gramps and my brother's sons called him Daddy's Daddy) has now passed away and the cabin had to be sold, but the memories remain and won't be forgotten for several more generations. Thanks for reminding me it is those memories I should continue to cherish as we build new ones on other lakes with my grandchildren. You captured a fantastic week so well. Love you! Wow. Every trip your family takes looks completely magical. You do such a great job describing it. The last picture should be enlarged and framed, it is awesome! Thanks for sharing! Every picture is absolutely amazing and everyone looks like they had a blast. 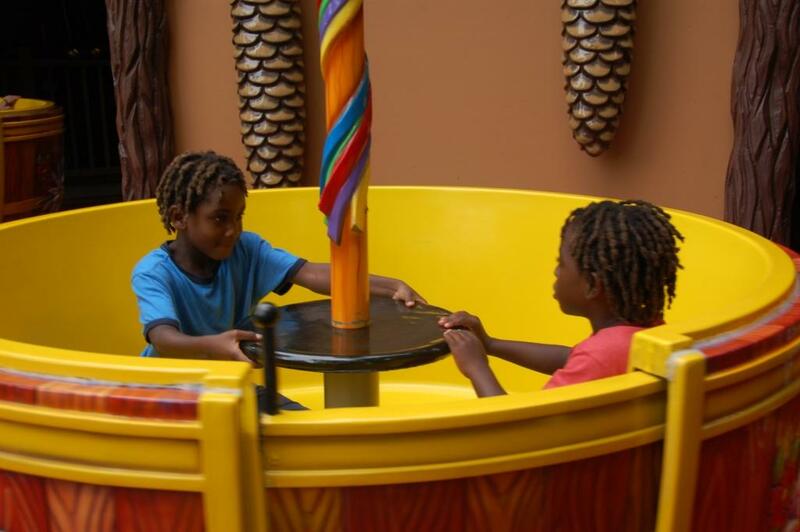 Thank you for sharing your family fun! Stunning – the location and the love. What a beautiful summer prayer! Amen. We just got back from a similar trip (including the drive time) to our friend's house at the Jersey Shore. 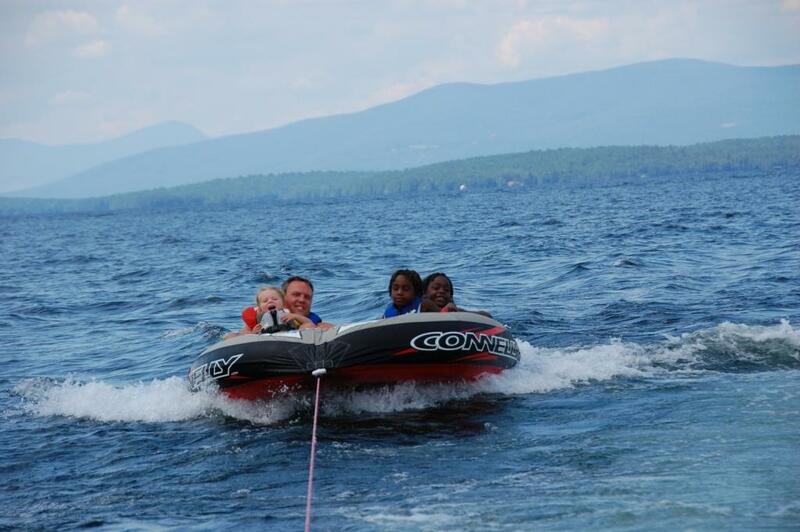 Our kids got to try surfing among other things but we left the tubing to the teens this trip. I feel refreshed just reading your reflections and looking at the photos–your positive and grateful spirit is such an inspiration to me.